On a recent trip to Santiago, my friend pulled his car over the side of the road. We followed, having no idea what he was up to. We got out and asked him. “The Topic of Cancer!” he exclaimed. On the way back we realized we’d missed all of the signs that said “Tropico de Cancer.” Trust me, if you will see if them if you are paying attention. 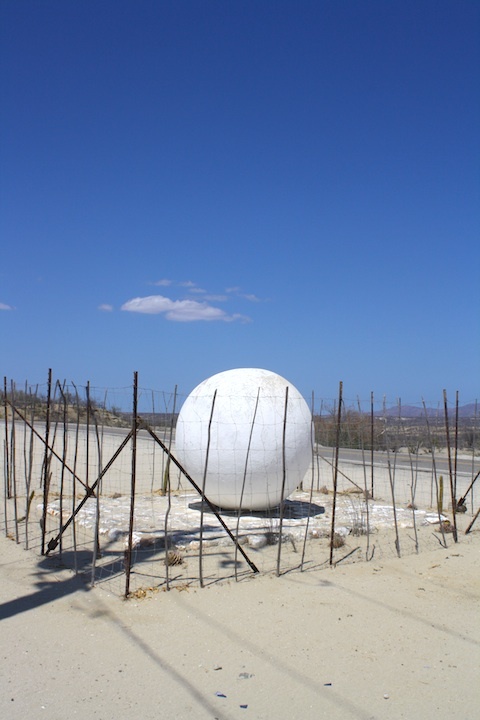 The Tropic of Cancer is the most northern spot that the sun travels directly above. The Tropic of Capricorn is its southern sibling. The equator lies between the two. This ball marks the Tropic of Cancer. You can get there from Cabo by driving up the road to La Paz. You’ll find the Tropic of Cancer to be about 45 minutes north. The drive is about 30 miles from San Jose del Cabo, just before you just to Santiago.